Acne Medication Market size was valued over USD 4.5 billion in 2017 and is expected to witness more than 6.5% CAGR from 2018 to 2024. Increasing prevalence and severity of acne globally will drive the global market over the projection years. Acne vulgaris is the most common skin problem amongst the teenaged population, with women being affected at higher rates than men. According to the Global Burden of Disease study, acne vulgaris affects approximately 85% of young adults aged between 12–25 years. Various factors such as fluctuating hormone levels, unhygienic lifestyle and excessive production of oil from sebaceous glands have increased the prevalence of acne, thereby positively affecting the market growth. In addition, western countries are more prone to acne due to the population’s dietary regimen characterized by high amounts of sugar, refined grains, high protein, and high-fat dairy products, hence boosting the market growth in countries such as U.S., UK and France. 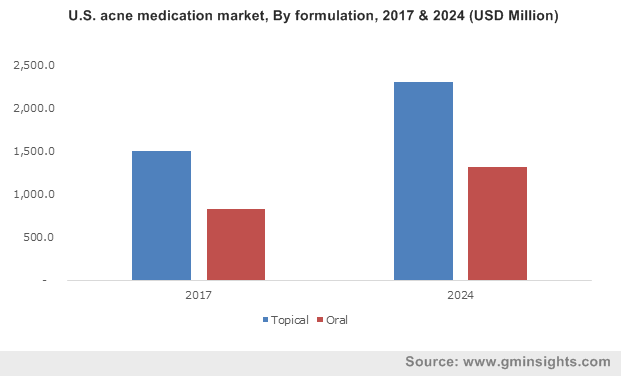 Topical acne medication industry segment held significant share of total product market valuation, accounting for a total value of USD 2,914.3 million 2017. Topical medication includes gel, creams and ointments that contain retinoids, salicylic acid, benzoyl peroxide and others. Factors such as lesser cost, lower risk of systemic adverse events and drug interactions will drive the market segment growth. 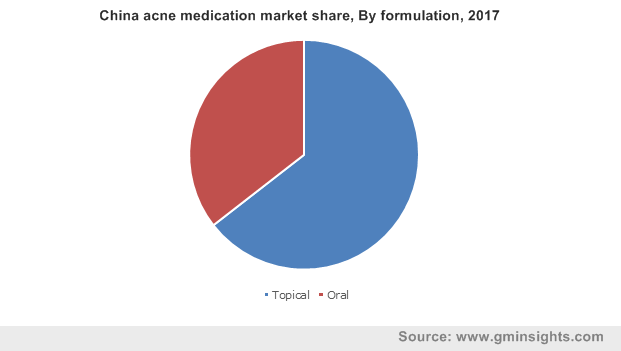 Oral acne medication indutry segment is estimated to expand at a CAGR of 6.9% over the forecast period. Such medications are quite effective where moderate to severe acne do not respond to topical agents. Oral medications such as antibiotics, birth control pills, isotretinoin get absorbed throughout one’s entire body, hence driving the segment growth in the near future. Retinoids market segment dominated the industry, accounting for USD 1,299.9 million in 2017. Retinoids (such as Retin-A and Differin) are the most effective for moderate to severe acne as unclogs pores, allowing other topical creams and gels to work better, thus driving the market growth. In addition, retinoids decrease post-inflammatory hyperpigmentation, while simultaneously preventing the formation of any new acne on the skin, hence increasing its application in the market. 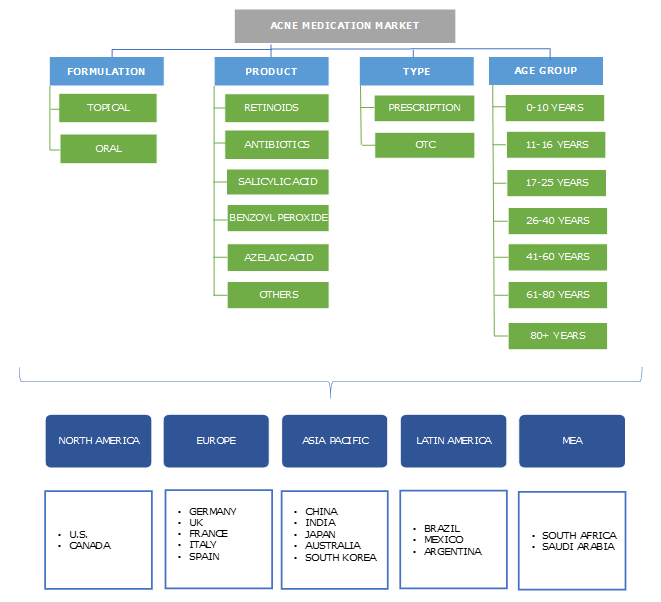 Azelaic acid market segment is estimated to expand at a CAGR of 7.6% during the forecast timeframe. Azelaic acid is extremely gentle on skin as compared to retinoids and benzoyl peroxide and can be easily used on super sensitive skins, thereby increasing its growth rate in the forecast period. Furthermore, azelaic acid is a good acne treatment choice for pregnant and nursing moms unlike other topical retinoids and oral acne medications, hence driving the segment growth. Over-the-counter (OTC) segment generated maximum revenue share in the year 2017 with a value of USD 2,420.9 million. Increased preference of patient population to use OTC products as they are convenient to purchase and inexpensive is propelling the market growth. 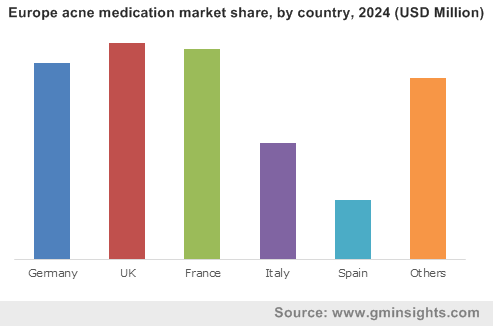 Prescription acne medication market segment is expected to experience robust growth of 6.3% over the projection period. Prescription acne products such as antibiotics are usually combined with benzoyl peroxide or a topical retinoid, that makes up for an effective combination, hence driving the prescription acne medication industry growth. 10-16 years age group market segment generated maximum revenue share in the year 2017 with a value of USD 1,772.1 million. Factors such as hormonal changes that come with puberty, hereditary aspects, and sedentary lifestyles that are very common in 10-16 years of age category is driving the market growth. According to the American Academy of Dermatology, almost 100% of all teenagers go through occasional acne breakouts. 17-25 years age group market segment is expected to experience robust growth at 6.7% over the projection period. Increasing incidence of sedentary habits such smoking, drinking and consumption of fatty foods will drive the growth of acne medication market in 17-25 years age group. U.S. market valued USD 2,331.5 million in the year 2017. Acne is the most common skin condition in the U.S., affecting up to 50-60 million Americans annually. Presence of better acne treatment options, increased affordability and greater awareness regarding acne treatment is boosting the market in the U.S.
India market is estimated to expand at a CAGR of 9.2% during the forecast timeframe. India has an estimated 200–300 million acne sufferers, that will eventually aid the market growth in India. Furthermore, increasing demand of the population to spend on facial appearance is also boosting the market growth in India. Some of the leading key players include Johnson & Johnson, Allergan plc, Galderma S.A., Reckitt Benckiser Group, Guthy-Renker, Stiefel Laboratories, Valeant Pharmaceuticals, Bayer AG, BioPharmX, and others. These companies have implemented strategic decisions such as partnerships and mergers to expand their product portfolio and geographic reach. In September 2018, Almirall SA finalized USD 550 million acquisition of four approved products and one new drug candidate from Allergan's medical dermatology unit in the U.S. Such acquisitions will aid in the expansion of product portfolio in acne medication industry. Acne medication industry is fragmented with number of players capturing major share in the global market. The market is expected to grow moderately due to the intense market clutter to find the best acne treatment options. Growing number of acne problems in developed as well as developing regions is positively influencing the market growth. North America has captured majority market share as severe acne prevalence is very common in the region, affection millions of people each year.